Backbone campaign, April 2015..Wikicommons/Charles Conatzer & the sHellNo! Action Council. Some rights reserved.The prominent climate scientist James Hansen, who comes to Norway on Tuesday, has called climate change a “planetary emergency.” This description reflects the consensus in climate science. The Intergovernmental Panel on Climate Change (IPCC) has concluded that global warming of over two degrees Celsius compared with pre-industrial levels will lead to a high risk of triggering mass species extinction, widespread ecosystem collapse, and the destruction of the livelihoods of hundreds of millions of people. Fossil fuel investments and existing decision-making processes are currently steering us towards a world that will be at least four degrees warmer by 2100. Such an extreme scenario has direct relevance for Norway’s plans for oil extraction in the Arctic. The Norwegian government recently opened 57 new ‘blocks’ of petroleum exploration acreage in waters that stretch to the edge of the Arctic sea ice in a process known as the ‘23rd licensing round.’ In February 2016, these blocks will, in all probability, be allocated to operators that have applied for exploration permits in the Barents Sea. This is business-as-usual for Norwegian petroleum policy. But since 1994 – the last time new blocks for exploration were opened in entirely new areas on the Norwegian continental shelf – we have gained far better knowledge about the climate. We now know that at least 70 per cent of the world’s remaining fossil fuel reserves must stay in the ground if we are to have a 50 per cent chance of keeping within the two-degree limit. Which reserves should be left in the ground – and where? Common limits for fossil fuel extraction are unlikely to be allocated and regulated through international law for the foreseeable future. But existing legislation at national level can contribute to clarifying where the lines should be drawn. A recent academic article by law professors Beate Sjåfjell and Anita Margrethe Halvorssen concludes that oil extraction in the Arctic – the area in the world where petroleum activities will have the worst environmental and human rights-related consequences, and contribute most to climate change – violates the Norwegian Constitution. Today’s aggressive oil policy lacks an empirical basis. Sjåfjell and Halvorssen also show that the consequences of the 23rd licensing round have not been properly assessed, and that citizens have therefore not received the information to which they are entitled. The Constitution gives citizens the right to information about “the effects of any encroachment on nature that is planned or carried out,” and thus the state’s deficient analysis of and information on the climate-related consequences of oil extraction in the Arctic is itself a breach of the Constitution. Norway is not alone in following an extraction trajectory that threatens civilisation. A long list of states and actors are jostling for position in the race for the remainder of the world’s fossil fuel reserves. So far, states have made promises on emissions reductions from 2020 that, according to a study conducted by MIT, can only limit global warming to 3.5 degrees. This is two degrees over the level James Hansen and many climate scientists consider safe. To what extent the pledges made at the coming Paris climate summit will be delivered on in practice also remains highly uncertain. The international community’s relative lawlessness when it comes to climate change does not give us a blank cheque to pursue an ‘anything goes’ policy on the Norwegian continental shelf. Norway’s domestic emissions are relatively low but, as an oil and gas exporter, we are the source of around 1.5 per cent of the annual CO2 increase from fossil fuels in the atmosphere. The giant Johan Sverdrup field alone will lead to nearly 800 million tonnes of CO2 emissions. Extraction in the Arctic is further indefensible because it will only be profitable with high oil demand – that is, in a world without effective climate policy. The twenty-third licensing round is based on the assumption that the international community will fail to observe the two-degree limit. When the state makes long-term plans on the Norwegian continental shelf that to such a great extent sabotage Norway’s broader climate targets, it runs roughshod over the limits laid down in the Constitution and violates our most basic rights. It is therefore necessary to turn to the courts for protection. A range of Norwegian organisations and individuals have begun exploring a possible climate civil action against the Norwegian state. The newly-formed Article 112 Association is now gathering support to prepare a lawsuit. Similar initiatives are spreading across the globe. In June, the Dutch foundation Urgenda had its claim upheld in court and the Dutch government was ordered to reduce its emissions. Two weeks ago, a court in Pakistan declared that the state must enforce its own climate targets after a suit launched by a farmer. Climate lawsuits are planned in Belgium and Australia, and Our Children’s Trust in the USA is using state law to limit emissions that are not regulated by federal authorities. Climate scientist James Hansen is a key player in this work and has also declared he is willing to appear as an expert witness in the action being prepared in Norway. Climate harms are caused by cumulative emissions, and the responsibility is shared between innumerable actors and individuals. But the consequences of the coming decades’ priorities alone, in Norway and across the globe, can be more destructive than any other wrong committed in human history. The Arctic must be protected as our shared frontline in the climate struggle. If the Norwegian parliament does not cancel the 23rd licensing round, a climate lawsuit with broad popular support will be an important part of a necessary project: to write the beginning of the end of the fairytale of unrestricted oil extraction in Norway. 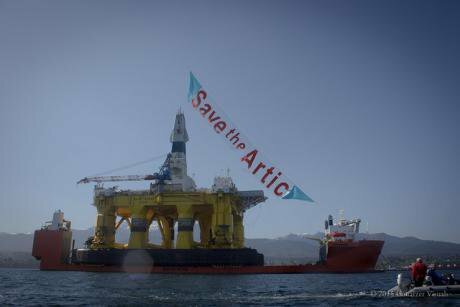 You can sign the petition ‘Stop unconstitutional oil drilling in the Arctic!’ at http://112aksjonen.no/english. 2,500 signatories upwards include authors Karl Ove Knausgård and Jostein Gaarder, musicians like Susanne Sundfør, and a series of high profile Norwegian academics, environmentalists and cultural figures. This article is an English translation based on an article published in the Norwegian newspaper Dagbladet.